Every entrepreneur dreams about transitioning to working full-time on their business. Coming up with the right strategy for this transition can be a daunting task. Do you quit your job to work on your business, or do you work on your business as a side project while still working full-time? Regardless of how you go about it, making the leap to full-time is daunting. Bill D’Alessandro and I answer these and other related questions as we share our experiences becoming full time entrepreneurs. Both Bill and I knew that we wanted to get out of the corporate world and work full-time on our businesses before we made the jump. Bill was more cautious and methodical about the process and I jumped in head first, but we both were able to accomplish what we set out to do. Listen in as we share our mistakes and our lessons learned, as well as our tips for creating a business plan that is perfect for you and your family. Andrew: On the show today, we’re talking about how to make the leap into full time eCommerce entrepreneurship. A lot of times, people wonder, “How do you do that? Do you quit cold turkey? Do you work something up on the side and then, once you’ve got some traction, you kind of make that leap?” I actually had a reader write in and ask about this, so that was the prompt for this episode. And joining me to tackle the issue, talk about it, and also share his experience, Mr. Bill DAlessandro, the man behind RebelCEO.com and half a dozen other businesses. Welcome, Bill. Bill: Thank you. Thanks for having me. Andrew: Yeah, excited to get into this because this is something we’ve both come at, I think, from different perspectives, have different stories on it. Bill: I get a ton of entrepreneurs asking me about this, too. “When should I quit my job? How do I know if this is real?” So, I talk to people about this a lot. So, it’s good that we’re going to record this, so we can have something that we send to people. Andrew: Yeah, it’ll be good. And we’re going to dive right in this week, so we’re going to go ahead and get right into it. How to make the jump into full time entrepreneurship. All right, so Bill, maybe you can kick us off here. Share your story. How did you, going from corporate world into full time for you, how did that look? How did that process unravel? Bill: Slowly, in one word. I was working in investment banking at the time, doing 80, 90 hour weeks and getting crushed and hating life. And I was just really at the point where I needed to either quit and do something else or jump through a plate glass window. And that’s when I read The Four Hour Work Week, which was perfect timing for me. And one thing lead to another, and I launched my first product, KP Elements, the story for which I’ve told long ago on this podcast, I think. But started nights and weekends, and I had changed job into a little bit less demanding job. So, I was working 50 hours a week, instead of 80 or 90, and I would come home and use the extra 30 or 40 that I was used to working on my business. My routine was I would get off at 6, I would go to the gym, I’d be home by 7, I’d bring some takeout home with me, and then I’d work on the business from 7 until midnight, every night. And that was 30 hours a week, -ish, 25 hours a week, 5 hours a night, plus a little bit on the weekends. And I got a 30-hour work week in, -ish, on my business. And that started in late 2010, and I didn’t go full time until mid-2012. So, for two years, I ran my business on the side, nights and weekends. The first thing about that is it forced me to automate and outsource from the very beginning because I just didn’t have the time to hold down a second job, actually physically running my business. So if I couldn’t outsource it, it couldn’t be done, which still has ripples in my business today of stuff that’s automated. But the other thing that was wonderful is I got paid a salary to start my business, and I had health insurance. And I had a stable job, which is really tough, if you quit too early. So, I did it for two years on the side before. . . I quit when I was making $50,000 from my side business, a year. So, it wasn’t a lot, it wasn’t full replacement income, but it was enough that I knew I could pay the rent. Then that’s when I went for it. Andrew: You were working from 7 to midnight, in terms of people calling you on the phones, with email, customer support throughout the day. Was that all some of the stuff you outsourced to either a call center or a VA? So did you handle all of that with someone else? Bill: Some of it outsourced. Some of it I just couldn’t do. We didn’t have a phone number. I was like, “Well, I can’t take calls throughout the day. There’s no phone number.” Email support only, and I would dip out at lunch to have meetings. Any meetings I had to have, I’d had at lunch. Occasionally, I would book a conference room for myself because I just had a cubicle at my job. So I would book a conference room for myself if I needed to do a private phone call. So I’d be sitting in the conference room alone on the speakerphone pretending I was on some work call. So I just catch as catch as catch can during the work day. It totally can be done, assuming you’re not at a super, super demanding, on the clock, every minute job. Andrew: Yeah, that’s interesting. My story was very different, apart from the beginning in finance, where we both were overworked and was doing that. To be honest, I didn’t know what, I probably shouldn’t admit this, but I didn’t know for sure what I wanted to do. And so I just knew I didn’t want to do banking anymore. So I spent a couple of years, probably 18 months, really stashing as much money as I could to build the runway up. Bill: While you were working in banking? Andrew: While I was working in banking. Yep, exactly. I pretty much spent money on food, going out with friends on the weekend, and pretty everything else banked, 50% plus banked. And so I had a runway, so I quit. And it took me a while to figure out what I wanted to do. I think the three options I was exploring –I don’t know if I’ve told you this, Bill– day trading, like options trading, I’m so glad I didn’t do that; photography. . .
Andrew: Yeah, seriously, being a freelance photographer; and eCommerce. And I spent probably, oh, four weeks, exploring all of those, dipping my feet into all of them, thinking through the pros and cons. And thank goodness I went with eCommerce. Andrew: Yeah, and so no job, just started the process of researching what I wanted to do. 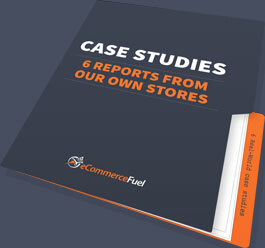 And a lot of the stuff I talk about in the e-book on eCommerceFuel.com, in terms of niche criteria, went through those and picked CB radios, of course, and went on. And for me, it was, oh, yeah, it was just a complete cold turkey, figure it out from scratch. Bill: So, you just ran out of gas. You’re like, “I can’t handle this crap anymore,” and you flipped your desk over and walked out? Andrew: Yeah, apart from the desk flipping. No, I left on really, really good terms with everybody. But I think I just knew, I think, six months in, I knew. I’m going to stick with the commitment I made to be here for two, two and a half years, but when I’m done with that, I’m going to be done. Yeah, I just knew I wanted to do something else. I wasn’t quite sure exactly what it was. Andrew: Yeah, which is crazy. Bill: And then how long did it take you before you decided that photography was not your bag and you wanted to do eCommerce, and then how long before you made your first dollar? Andrew: Yeah, good question. It took me about a month to think through the options and settle on eCommerce. And I was toying with all of them. And I was doing a little bit of options trading. I was putting my feelers out there for some photography contracts. I was researching drop shipping and eCommerce. And based on the first two, just thinking through everything, I just said, “No, the risk-to-reward ratio and the lifestyle, I think I’ll enjoy so much greater with eCommerce.” So, I went with that and I just kind of scaled up. And in terms of the first dollar, it took me about, you mentioned the $50,000 mark. It took me right around a year to get to the $50,000 in profit mark on a monthly run rate. So, I think we’re about in the same ball park there. I think sometimes it depends on the personality, but if you’ve got another gig going on, you were amazingly disciplined. For me, I’m not sure if I could’ve been that disciplined with a side job because I’d be like, “I’ll do it next week” or “I’ll do it this weekend.” It would’ve been harder for me to maybe really clamp down if I had an income coming in on the side. Bill: Yep. Yeah, I can see that. I liked my job at the time. I transitioned to work in a tech company, and I liked my job. So, I was enjoying 40 hours a week, but I also knew I wasn’t enjoying having a boss, even though my boss at the time was fantastic. He was wonderful and we’re still friends. But I just want to run my own show. I always knew I wanted to and I wanted to get there, but it was awful nice to get paid while doing the startup. It let me sleep a lot better at night. Andrew: Oh, yeah. So people that maybe are thinking about doing it on the side because I think on the side probably is a better model for most people, how did you get 30 hours a week done? Because it’s easy to say, “I came home, I worked from 7 to 12.” It’s a lot harder to do it in reality when friends want to go out, when you’re tired from a day of work, when the NBA finals are on. How did you do that? Bill: Yeah. Well, I think I did have one huge advantage, which was that I was single. So I came home, and nobody would bother me. It’d just be me and I would focus and nobody would bug me. I could, obviously, go out with my friends if I wanted. But I didn’t have to see my kids after work or anything like that or have spouse that was wanting to spend time with me, which honestly I think was one of the only ways I was able to pull it off. Because typically that 7 to 10 or midnight time, that’s spouse time or girlfriend time or kid time. And then when I came home, I was like, “As long as I accomplish one thing, if I accomplish more, that’s better, but as long as I accomplish one thing every day, that will be enough.” And if you have 50 things, one thing, like, “List job on Elance,” it takes you 15 minutes and it doesn’t feel like much. But you do one every day, in 50 days, you’ve launched the business. It’s amazing how the small things compound. It’s like if you’re trying to lose weight or work out, it’s like all you got to do is be on the treadmill for 15 minute. It doesn’t matter whether I walk or run. I just got to do it. And it was the same thing for me with starting my business. I was like, “As long as I do one of these small things every day, as long as I take one step forward. Then I’ll get there.” Some days, I knocked out five. But some days, it was just one, and then I went out to the bar or I went to sleep or I zoned out and watched TV or whatever. But I tried to do one every day. Andrew: That’s a really good approach. And there’s something incredibly, I don’t know if therapeutic’s the right word, maybe, I’ll stick with it, about breaking down. I do this, too, with big projects, like the redesign for Right Channel. First thing I do when we get ready to do that is I sit down for, sometimes it takes a while too. A lot of times, I’ll allocate an entire day to breaking up huge projects down into bite-sized pieces. Because when you do that, it feels so much more manageable and achievable. And you can look at that, you can delegate. And that list always is growing and evolving and changing, but it makes it so much easier to tackle when you invest the time to really break it up. Bill: Yeah. That was key for me because I couldn’t afford to waste time or be tired or put it off. So, to break it down into manageable chunks, I think, for any task. Starting a business is just one task for which that works. It’s a good approach. Andrew: What do you think the focus should be when people are working part time? Should it be, early on, really trying to build profit, to show profitability with your business, to be able to say, “I can actually make money on this.” Or do you think it’s more important to build momentum and have revenue growth and be reinvesting? Because you make an argument for either one. What are your thoughts? Bill: I think it probably depends on whether you have a full time income otherwise or not. If you need this business to pay for your rent or your mortgage immediately, then profitability probably becomes a lot more urgent. But if you’re working part time and you still have a job and health insurance, then maybe you can focus a little more on the ramp, at the expense of profitability maybe. So, I would generally say focus on the ramp, with a caveat, which is, as you ramp your revenue, watch your expenses, and try to identify which of these expenses are truly optional, ones that you’re electing to make in order to grow faster. And then imagine your income statement if those expenses were gone, and then say, “Could I be profitable within a week? If I just decided within a week to stop aggressively reinvesting and slow my growth and to begin to harvest from the business, how much could I make just by deciding to stop things. If I really had to get blood from the stone, what could I just turn off, as far as expenses? What is my pro-forma at profitability?” So I would watch that number, too, knowing that if things went bad or you needed money or you needed to quit your job or whatever it might be, how profitable could it be? Andrew: Yeah, I think you hit the nail right on the head. And I had a hybrid approach that was similar for the first probably six months. I wasn’t making hardly anything off the business and was focused more on growing the revenue side, partially to build momentum, but partially to be able to just get a sense for the business. Because I don’t know about you, Bill, but when I started selling radios, I didn’t know anything about them. I didn’t really know who wanted to buy them or what problems people had with them. And so for me, just getting revenue in the door, even if it was almost making nothing, was such a huge learning experience. It was motivational. If you’re going to make nothing, I would much rather make nothing on at least some revenue that was growing versus no revenue from a motivational standpoint to get going in the early day. It’s psychological, but it helps. But I think, yeah, focus on growth, but make sure that you’ve got an underlying model that is going to be profitable. Andrew: Yeah. 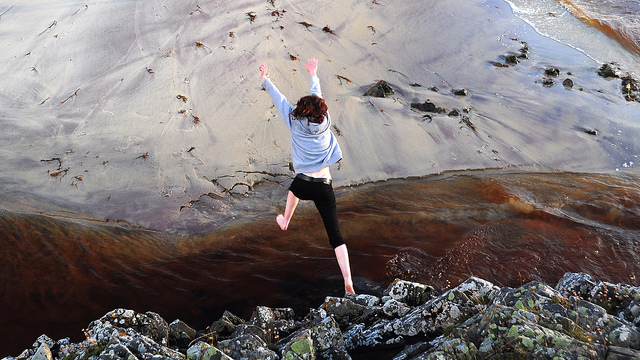 What do you think about when you make the leap to quit your job? Let’s assume you’re working part time, or working even part or full time. I’ll say full time. How do you know when you can quit your job and go into your business? Do you need to be replacing your full time income? What did that look like for you, and what do you think generally people should do? Andrew: It sounds like it could’ve been launchable. Bill: So clearly, and your friends will go, “Yeah, right, man. Go for it. I hate my job. That would be so inspiring if you would quit your job.” They’ll tell you to do it, but that’s because it’s no skin off their back if you quit your job, fall flat on your face, and end up in a homeless shelter. They’ll lie to you. It’s not because they’re mean. It’s because they’re trying to be supportive and they don’t understand, they’re not the one taking the risk. So I really, really, really would advise not listening to your friends or family when you’re trying to decide whether or not to quit or whether or not you have an idea that’s a good idea or whether your idea has legs, because they all like you. That’s why they’re your friends and your family, and they’ll want to be supportive and they’ll lie to you, not out of malice but out of support. So, I would say you got to see it in the numbers if you’re going to quit before you have full time income. Andrew: Yeah, agreed. It’s funny. You mentioned the not listening to your friends and family. For me, Annie was one notable exception, who was pretty steadfast in just her support and belief, but I had a lot of family members, especially my mom, I think I’ve mentioned before. When I told her, I was like, “Hey, mom. I’m quitting my job.” She was like, “Oh. You sure you want to do that?” And I was like, “Yeah.” And she went, “What are you going to do?” I’m like, “I don’t know. I’ll figure it out.” And she was like, “All right. It’s a pretty good job.” I was like, “Yeah, I know.” And then when I started selling CB radios, she was like, “Are you. . .? What? You went from banking to selling. . .?” She was still very loving and supportive, but it was not a healthy dose of skepticism from her and a lot of my friends as well. So yeah, if you’re listening to other people, it’s tough because you want to take feedback from people but you’ve got to realize other people’s biases that they have, for better or for worse. Andrew: And back to the runway and when to make the quit, I don’t think you necessarily have to be replacing your entire income verbatim but you need to have a combination of growth that is providing income, as well as some financial resources as a cushion that can maybe bridge that income gap between the growth trajectory and what you’re making now. So, you don’t want to just quit and hope on a prayer that you double overnight. But if you have a little bit of savings. . . Now, it’s amazing what a little bit of savings, that the flexibility and options savings. We can probably just do an episode on that. I’d probably rant and rave for an hour straight. You’d never come on again, Bill. Andrew: Yeah, about just savings and debt and stuff like that, but just being conservative with money. But yeah, if you’ve got that good trajectory, it can help a lot. So you had that number. I think that’s a huge thing, too. If you can have a tangible number that you can shoot for and you think through that. You look at all your expenses. That can help a ton. You and I, Bill, we had the luxury of being able to do this without dependents, without a spouse, which makes it infinitely easier. What are your thoughts on doing it if you do have kids, if you do have a spouse, especially from the financial side and maybe getting on board with either your girlfriend or your wife or whoever it is? Bill: Obviously, not an area I have a lot of experience in. That would make me a lot more nervous. I can only imagine the responsibility of needing a family health insurance plan and having kids or a wife that depended on you. I imagine that would be tough. On the flip side, you do have a built-in support network and some free labor. Andrew: Maybe that’s the trade-off. Bill: It could be something you go into with your spouse together, and if she is really into it with you, I think that could be. . . I’ve seen some husband/wife partnerships work really well, where they both work in the business and they enjoy that. And then I’ve also seen some couples, where they just say, “This is separate.” Whoever owns the business says, “This is my job.” The spouse doesn’t really participate or has a different job and they keep it separate because they want to be able to “go home at night” and have separation there. So I’ve seen it work both ways. I think it depends a lot on their relationship. Andrew: Yeah, and I think one of the things that’s hardest for a spouse, maybe not in the business, is the uncertainty of, “Hey, you’re quitting your job. You’re starting a business. How do we know this is working? And if it’s not working, is there any finite endpoint, where we can cut our losses and get back to some sense of stability.” Because it’s one thing to face risk and uncertainty when you’re the guy or the girl running the business. It’s completely different when someone, even if it’s someone you trust, is the one behind the wheel. So I think one thing that can help a lot with this is, if you are getting ready to quit, just have candid conversations. Ask your spouse or whoever it is, “How much are you willing to spend on this.” It’s like, “What is going to make you really uncomfortable? How much of our savings are you comfortable with us investing in the business or using it as a runway before you’re going to start to feel really nervous or maybe really resentful that we’re spending this much?” And have a number where you can say, “Hey, I’ll be making X by nine months in, by 12 months in. Otherwise, if not, we’ll go back and I’ll go back and get a job. I’ll work part time,” or something, so you have some tangible milepost. Not only to keep yourself accountable, but to bring some sense of security and accountability to whoever it is that’s in it with you. Bill: You mentioned going back. I think many people, in general, underestimate how easy it is to reverse decisions in your life, obviously with some exceptions. But typically, if you quit your job on good terms and you say to your employer, “I’ve got this business idea. I’m really excited about it. It’s obviously not directly competitive with you guys and I didn’t steal anything from you. But I’m going to go pursue my dream.” I have heard so many people, and you’re just another one today, Andrew, where the employer has been very, very supportive. Andrew: No, not at all. But on the downside, you and I both mentioned, when we were chatting late night in Chicago, that one of our recurring nightmares is going back and working in banking. Bill: That’s true. That is true. That is true. Andrew: So yeah, not irreversible at all. But you’re right. In anything in life, most things are not permanent. With a few exceptions, you can unravel most of them. Bill: I haven’t gone to work in three years. I just passed that milestone a couple of weeks ago. And now, I feel like I am thoroughly unemployable, just from I would not make a very good employee anymore. I don’t think I could tolerate all of the, “We’ll do it my way because I’m the boss” or “This is how it’s done here.” If this doesn’t work out, I’m just, I don’t know, moving in with you and Annie on your compound in Montana. Andrew: Oh, we’d love to have you, man. Bill: It’s this or bust at this point for me. Andrew: If you can make it over the rain forest concrete, barbed wire walls, you’re more than welcome. Bill: All comers who can pass the test of strength. Andrew: Right. If he’s that bold and strong, we want him, right? Bill, it’s been fun, man. And if you’re on the fence about this, if you’re working part time, let us know. We’d love to hear from you. I’m @Youderian on Twitter. Bill is @BillDA, and of course, eCommerceFuel.com/Contact. You can get a hold of us. Hope this is helpful. Bill, as always, it’s been a lot of fun. And if you’re not familiar with Bill’s work by now, make sure to check him out at RebelCEO.com. He’s got a bunch of really insightful and entertaining blog posts over there. Thanks for coming on, Bill. Bill: Yeah, no problem. This was fun. I hope we helped some people out. Of course, that is who you ask. This is a super timely post! Bill, I am in the exact same situation as you were in when working full time. My job makes it easy to build a biz partly because I like my job, so not stressed out over it and I have so much time on my hands to do a lot of research on marketing, seo, etc. Also decided to stay single so I could just focus on this and this only. It’s refreshing to hear someone on the exact same path. I can’t wait to read/hear more! What type of business do you own exactly? I have a personal development for image & beauty blog, and I am currently building a beauty and skincare store to complement the site. My question is should I pay off my student debt, or pay myself? I am working full time now, so I can be aggressive on paying debt off. If one went full time on their how does that dynamic change the debt repayment efforts?